Did you just hungry as the clock struck 9? We’ve got you covered. Looking for good food a little late in the evening in Doylestown? Check out Finney’s Pub Late Night Menu! Our late night food options are designed to go great with your favorite beer, wine or cocktail — or to take home to enjoy. Our late night menu for your consideration. 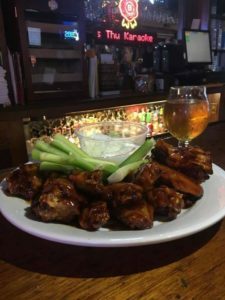 Pop on over to our Wings Page for a full list of flavors complete with a description. Build your favorite kind of fries late at night or leaf through a few finger food classics. Chicken Fingers, Shrimp Baskets, even some comfort food deep-fried goodness in our Mac & Cheese Bites and Spear-Cut Fried Pickles. Click the menu to see what we’ve got!